Today I would like to share with you the contents of two precious packages that have arrived here at The Tiki Hut from two talented bloggers — Julie of Being Ruby and Jane of Artfully Graced. What Julie Ruby, can do with one of her photos always gives me a feeling of awe. Her altered images continue to inspire me in my own pursuit of photography as art. In May I was one of the very lucky winners in a giveaway on her blog. 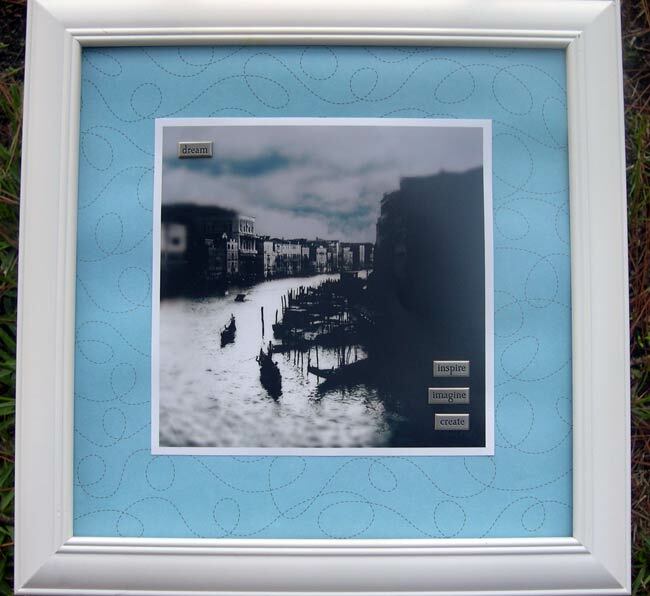 The photo was one she took on a trip to Venice, Italy in 1996. After she added that special "Ruby-touch" the dreamlike quality of the gondolas on the canal just drew me in. Are there any of us who have not dreamed of being a passenger under the careful direction of a Venetian gondolier? I love this photo, but even more, I love the inspiration Julie's art provides me. When deciding how I wanted to frame this piece, I knew I wanted to hang it in my studio. I played around with different frames and mats. I chose a white frame, but the mats were not really achieving the effect I wanted. Instead I mounted the photo on this piece of paper, I think the lines give a sense of movement, like movement through the canals of the Venetian Lagoon. Did you know that the lagoon is composed of 117 islands held together by a series of canals? This is what I was trying to express when framing this altered image. 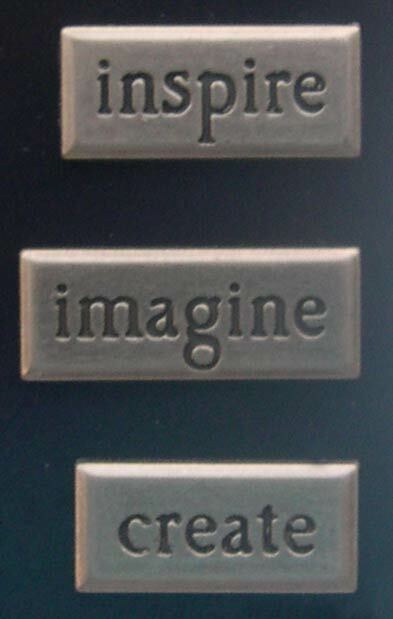 I then decided to add some of these metal plaques. The one in the upper left reads dream. In the lower left corner I added more because Julie [aka Ruby] continues to inspire me to imagine the possibilities and then to create that vision in my own art. Thank you Julie, I hope you like what I did with your fabulous photo. Next to arrive via the postal service was a special housewarming gift from Jane. Jane lives very near to where I lived in Florida. She describes herself "With a traveling husband and an empty nest, I spend a lot of time painting and writing." She goes on to say that, "One of these days, I will live right beside the sea...preferably on the Atlantic Ocean near St. Augustine. Then I will be able to walk on the beach whenever I want...without getting into a car to get there!" Yes, Jane is a beach gal, just like me. The paintings that I've seen and admired all have a beachy theme to them, so what's not to love? She collects and decorates with seashells and she wants to eventually move over here to the Atlantic, she is a gal after my own heart and a sweet, sweet friend. I was overjoyed to learn that Jane had painted me "Shellbelle's Tiki Hut." Can you believe that? In the attached note, Jane wrote, "Hope this little "tiki hut" will remind you of the Bay Area." It does! In an email exchange I told her that I loved that she painted it red. Why? Because in my Florida home I had painted one of the walls in my living room RED. I loved that wall and so this delightful painting reminds me, not only of the Tampa Bay Area, but also of my home there. It also reminds me of all the dear friends I've made through blogging. How we are there to share life's joys with each other, how we lift each others spirits when we're down and how genuine friendships can bloom across the internet through blogging. For this I am most grateful and humbled. In my new home I have a table directly across from my front door. This is the focal point of my new digs and on it I have created a little vignette of things I love and things that remind me of the beach. I placed Jane's painting there and it is perfect! I love the pop of color that it adds and the sweet memories it brings. for adding such special touches to my new home! Two of my favorite people in the blogosphere are Julie and Jane. How lucky you are to own their art! I am touched by your kind words. Thank you, again. It pleases me so much that you like the little painting I did for you. You are one of my favorite blog friends...and I am so sorry we never had the opportunity to meet when you lived nearby. The photo from Julie is so beautiful. I love her work...and her blog. She, too, is one of my favs in the blog world. Re: my latest post...I did think of you when I put this one together. The song came to me as I watched Rowdy (the goldie) and Hannah (the blue heeler) rolling in the grass, enjoying the sun. I never could get Hannah's little face...I'll save her for another post. I'm pleased that it brought a smile to your face. Blogging has opened a whole new world for me...and introduced me to so many wonderful people. It's a joy to open my computer every morning. what beautiful, thoughtful treasures from across and near the sea! I so love my blogging friends.. Wonderful art..., and I love what you did with the photo!! I want exactly what Jane wants, yeah..., live on the Atlantic Ocean and be able to walk on the beach whenever I want...without getting into a car to get there!!! This is a great post! I love to hear about other bloggers connecting in friendship with each other. It's so reaffirming! 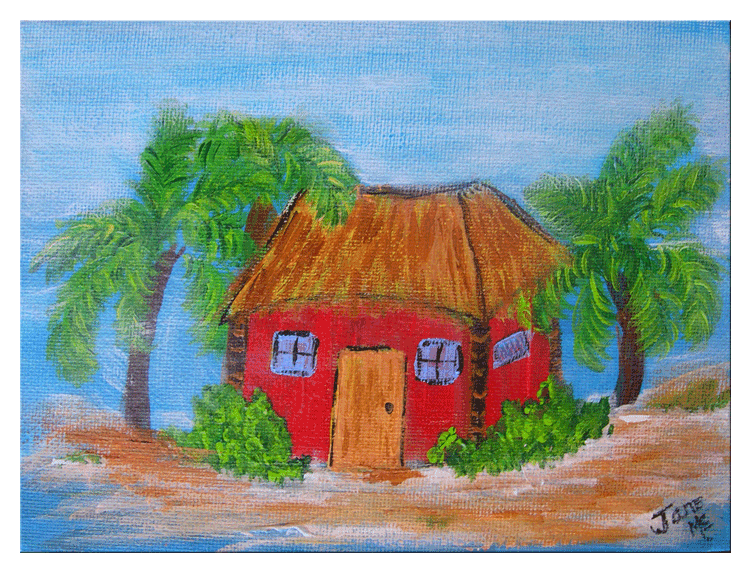 I love your little red tiki hut from Jane! I also love how you framed Julies picture. It does have a flowing look to it! These are some wonderfully artful bloggers! Your gifts are gorgeous. I love how you framed the Venice picture. The little metal plaques finish it off perfectly. The painting of Shellebelles's Tiki Hut is wonderful. The colors are gorgeous and I m so happy to hear it reminds you of your old home. Wow a double header with two gifts from two wonderful people. Hope you are having fun in your place. Your gifts are wonderful! 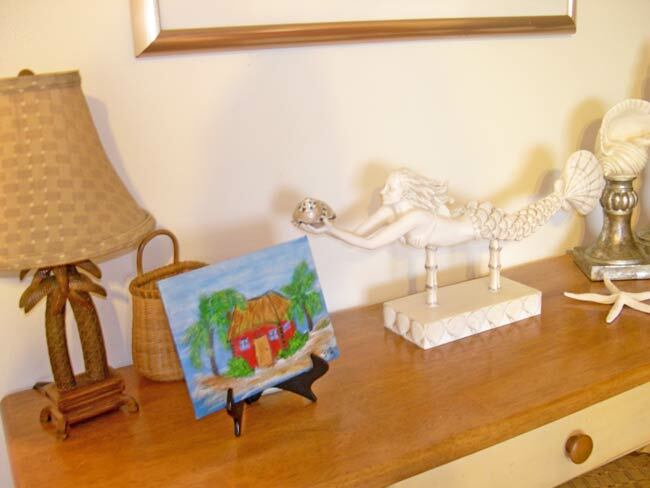 I love the Shellebelles's Tiki Hut painting by Jane. I love her work. As for Julie of Being Ruby, this is the first time I have seen her blog. Love her pictures. I will definitely visit her again. I have gotten behind again in my reading and I am ashamed to admit that I did not know about Sheldon until yesterday. I am so sorry. I definitely know the pain of losing a wonderful companion like Sheldon. I pray you find comfort in warm and loving memories of Sheldon. No words can erase the sadness you feel, but may it help to know there are others who understand and care. Your beautiful artwork is so special. You are fortunate to have such loving, dear friends. The little red hut print looks great on your entryway table. You got some great gifts there, I love them both! And I hope your feeling better. I know losing a pet is very hard. What a sweetheart your are... I'm so glad you are enjoying your view of Venice.. and i think your words today inspire me to imagine and create.... and keep dreaming!! You are so very lucky to have received such wonderful gifts!! I love bloggers! This is such an amazing community of good and giving people. Thank you for spreading the blogging love.